While I was at Redang Island for the sea turtle rescue unit (SEATRU) volunteer program, I often observed something glittering in the water at night. One night I picked them up and they glowed at the tip of my index finger, bright enough to actually see the minute detail of my finger. I've seen these creatures in National Geographic, and they are supposed to dwell at the bottom of the ocean. I remember the narrator talked about how deep-sea creatures rely heavily upon these bioluminescent plankton to hunt and to evade predators. But those I saw were in shallow water. 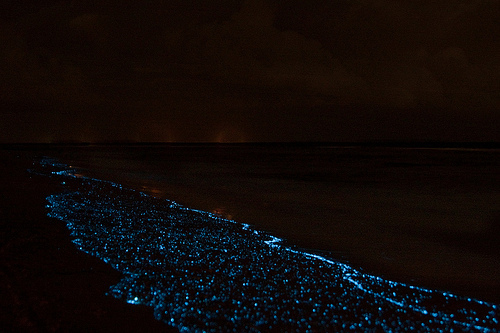 These are called bioluminescent plankton. They glow because of the luciferins in their body. The light is produced by a series of oxidation reactions set off by a catalyst called luciferase. The interesting part is, they glow when they are agitated, or when they sense perturbation in their surrounding. For example when a squid swims it induces current which agitates the plankton, and thus they glow. That's how predators and prey detect each other's presence in the ocean at night. 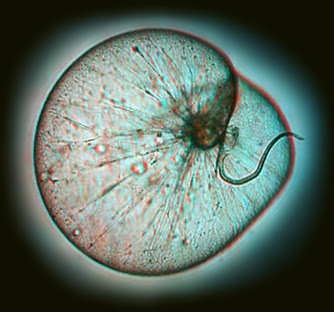 Why bioluminescent planktons evolve such characteristic is baffling to me. If I were a plankton, I would certainly want to conceal myself from plankton-eaters and not advertise my presence by glowing in the dark. One explanation suggests that by emitting light when agitated, the planktons are actually attracting more predators toward itself, making smaller plankton-eaters to worry about their own safety. That wouldn't work against the Blue Whale though. So if you happen to go diving or snorkeling at night, turn off your light and wave your hands through the water. And watch the most primitive form of lighting.